Is the USA Network thriller about to take a hard turn toward science fiction? Here's what Sam Esmail tells THR. Well, that's one way to reveal a master plan. In the opening minutes of the season three premiere, Mr. Robot pulled back the curtain on one of the show's longest simmering mysteries, at least in part. The moment, which was withheld from the early version of the scene released earlier in the week, involves a look inside the Washington Township power plant, the same work site that effectively killed Edward Alderson (Christian Slater) and put Elliot (Rami Malek) on the path toward building fsociety in order to destroy "Evil Corp." What's more, this is the place that houses the enigmatic project near and dear to Whiterose (B.D. Wong), the time-obsessed Dark Army leader publicly known to the world as Zhang, China's minister of state security. What's inside the Washington Township reactor? Great question. Even with a look inside the place, the answer remains uncertain. 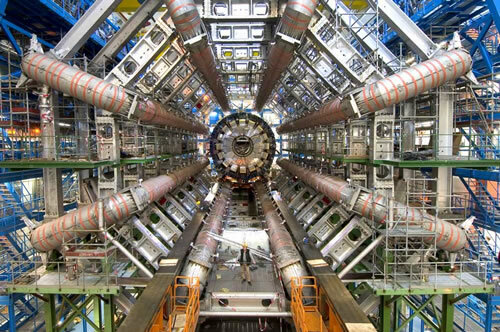 Here's what we know for sure: Some massive device exists within the space, one that closely resembles a collider, or particle accelerator, a massive tool used in particle physics. Compare the image seen in the season premiere with the image seen here, and draw your conclusions accordingly. For his part, creator Sam Esmail is stopping short of defining the device, but he tells The Hollywood Reporter that it was crucial to arrive at this moment right away in the season premiere. "What I wanted to reveal was Whiterose's motivation," says Esmail. "Whiterose has been so fixated on this for the past two seasons, we felt we had to finally show the thing. What that thing does exactly, and why Whiterose is so obsessed with it. That's obviously a mystery we're going to play out over the course of the series. We felt we needed to open this season showing Whiterose's 'project,' as she refers to it, and showing just how far she's willing to go to follow through on that project. Sure, we definitely still tease it out and hint it out through [future] storylines, but for the first episode, it felt important to at least give you the visual of Whiterose's main motivation." Whatever the exact nature of the device, it almost certainly has roots in one of Whiterose's stated favorite topics: time travel and parallel universes. In season two, Whiterose, in her public guise as Minister Zhang, speaks with FBI agent Dom DiPierro (Grace Gummer) about the notion of alternate realities: "Have you ever wondered how the world would look if the Five/Nine Hack had never happened? In fact, some believe there are alternate realities playing out that very scenario, with other lives we're leading, and other people that we've become. The contemplation moves me very deeply." Even in this very episode, when viewers are first invited into the Washington Township reactor, a scientist addresses those same notions: "I love a great mystery. And I'm fascinated by the greatest unsolved mystery: Do we see reality as it is? If I close my eyes, I can imagine that everything we experience, think and do is unfolding simultaneously in a parallel universe. And if so, how many copies of ourselves exist, and might our mental states be conjoined, for better or for worse?" Given Whiterose's interest in the subject matter, given her subordinate's veritable repetition of her same interests, and given conversation that swirls around the colliders' possible uses in the exploration of these topics, the stage is very much set for Mr. Robot to veer directly into science fiction territory this season. For his part, when pressed on the subject, Esmail remains coy, though he promises that however this story plays out, it will have a basis in our reality. "I can neither confirm nor deny, because I don't want to say anything that's too spoilery," he says. "But I will say we try to be as rooted and grounded with the real world as possible. Even though we're in an alternate timeline, we still see a lot of parallels, given the fucked up nature of the world that parallel story is in to our real world. We think it's important to keep that credibility to the world we know. I'll leave it at that. I'll say this: In the real world, we do have a lot of people with wealth and power who have some lofty designs on the nature of reality and how technology can manipulate that reality. It's in that realm that I think we keep the show in." When it comes to the actors involved in Mr. Robot, the contemplation of alternate realities and time travel and science fiction moves them, if not as deeply as Whiterose. Indeed, in the case of Carly Chaikin, who plays Darlene Alderson, it leaves her somewhat dumbfounded. "For all I know, we could all become elephants. I really have no idea what's going to happen!" she says. "But if it does end up going that route, whatever [Esmail] does, he'll make it great and beautiful." "Every step of this process has been enlightening," adds Rami Malek, weighing in on the exploration of the Washington Township power plant. "Things like that, as shocking as they may be to you, are just steps of this story unfolding as I expect it to be — and by that I mean, it's going to be striking, it's going to be bold, and I am often less shocked than everyone else. I've come to understand that some of the most rewarding and astonishing things don't happen like they do in other shows, like in the season finale or the series finale. They happen in the first episode, or the third episode, or before a commercial break, which is rare these days. They happen before the first commercial break of the fourth episode. It's a testament to Sam's storytelling, that you really can't leave your seat when you would expect to, watching other shows. Some of the most mind-blowing discoveries happen at the time when you least expect them to. I think that's what makes the show so special." Follow THR.com/MrRobot for more interviews, news, theories and podcasts all season long.